LAS VEGAS – Oct. 14, 2016 – Shelby American, Inc., a wholly owned subsidiary of Carroll Shelby International Inc. (CSBI:PK), has teamed up with Gaudin Ford to auction the first production Shelby GTE (Lot #3003) at Barrett-Jackson’s 9th Annual Las Vegas Auction on Saturday, October 15, 2016 at approximately 5:30 p.m. PDT. All of the proceeds will benefit the Grant A Gift Autism Foundation, dedicated to helping children, youth and their families fight autism by providing diagnostic and treatment funding, support services, social skills and vocational training, transition planning, and education. Unveiled recently, the Shelby GTE package is available for the 2015-2017 Mustang 5.0 and EcoBoost exclusively through Shelby American. The winner of Barrett-Jackson lot No. 3003 will have the first production Shelby GTE, CSM 17GTE0002 that includes custom touches such as an upfit package donated by Shelby American and a one-of-one charcoal carbon-fiber stripe package that’s unique to this car. 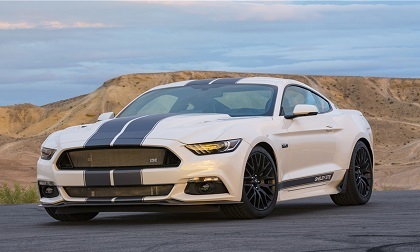 In addition to an appearance package, the custom Shelby GTE features Ford’s iconic 5.0 engine with a one-of-a-kind Platinum White Metallic supercharger that was donated by Kenne Bell. Additional performance upgrades include a Ford Performance cat-back exhaust and handling pack, 19-inch Ford Performance wheels and Ford’s new live rear axle which helps keep all 750 horsepower planted firmly to the pavement. Complete vehicle specs of the Shelby GTE can be found here. Founded by legend Carroll Shelby, Shelby American manufactures and markets performance vehicles and related products. The company builds authentic continuation Cobras, including the 427 S/C, 289 FIA, 289 street car and Daytona Coupe component vehicles; it offers the Shelby GT, 1000, GT500 Super Snake, Shelby Terlingua Racing Team and GTS post-title packages for the 2005-2016 Ford Mustang. Shelby American also builds the Shelby Raptor and Shelby F-150 muscle trucks. For more information, visit www.shelby.com. Founded in 2009, Grant a Gift Autism Foundation grew out of the struggle of a mom whose son, Grant, was diagnosed with autism and other neuro-developmental conditions. Grant a Gift Autism Foundation is a nonprofit 501(c)(3) organization helping children, youth and their families fight autism by providing diagnostic and treatment funding, support services, social skills and vocational training, transition planning, and education. For more information, please visit grantagiftfoundation.org.